Any quantity available for $9.99 per oz over spot! 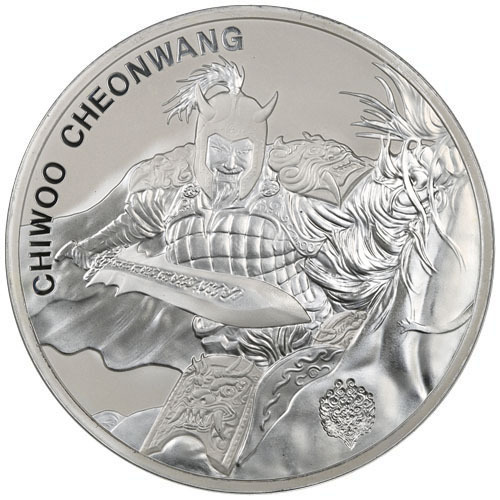 The Chiwoo Cheonwang is South Koreas premier silver bullion series. Introduced in 2016, the collection has rapidly gained popularity and is now teamed with another major issue from KOMSCO in the form of privy marks from the Zi:Sin collection. The first character from the Zi:Sin Series is now available as a privy on the Chiwoo Cheonwang medal. Today, 2018 1 oz South Korean Silver Chiwoo Cheonwang Gallus Privy medals are available to you online from JM Bullion. Arrives inside of protective packaging, tubes of 25, or sealed mint boxes of 250 medals! 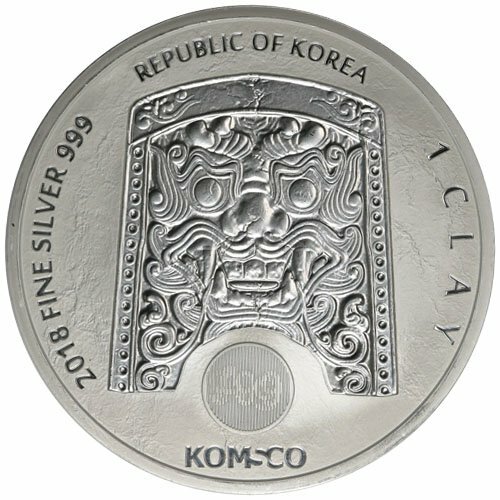 3rd issue of Chiwoo Cheonwang Silver Medals! Gallus Privy represents 1st design from the Zi:Sin Series! Limited mintage of only 5,000 medals! On the obverse is the shield of Chiwoo Cheonwang with KOMSCO logo and security mark. The reverse includes Chiwoo Cheonwang as he rides through the battlefield with a Gallus privy in the design field. Chiwoo Cheonwang is a symbol of the Red Devils, the fan group of the national soccer team for the Republic of Korea. Beyond his modern use, Chiwoo was originally known as a founding father of one of Chinas original tribes and is considered a God of War in Korean culture. The series featuring his image debuted from KOMSCO in 2016. All of these 2018 1 oz South Korean Silver Chiwoo Cheonwang Gallus Privy Medals are available to you in Brilliant Uncirculated condition. The medals include a small Gallus privy mark on the reverse and are available individually in protective packaging, inside of mint tubes of 25 medals, or inside of mint boxes that include 10 tubes for a total of 250 medals. On the obverse side of 2018 South Korean Silver Chiwoo Cheonwang medals is the image of Chiwoos shield. His shield bears the face of Do ggae bi, a grotesque figure who is believed to possess the power to ward off evil spirits. This side of all Chiwoo Cheonwang medals includes a latent security feature below the shield and the logo of KOMSCO. The reverse side of 2018 1 oz South Korean Silver Chiwoo Cheonwang Gallus Privy medals features the third design of Chiwoo in the collection. The advancing designs of the series follow Chiwoo as he prepares for, and ultimately rides into, battle. In this design, there is also a privy mark of Gallus, one of the Twelve Guardians and a leader of gods armies in the battle against evil in this world. Please feel free to reach out to JM Bullion as you buy silver. You can call our customer service team at 800-276-6508, chat with us live online, or simply send us an email with your inquiries.